This is a paperback reprint of a book first published in 1913, when Arthur Rackham was at the height of his fame. The 44 colour plates are drawings made for Rackham’s own satisfaction, rather than commissioned illustrations, though they are mostly so much in the vein of his commissioned work that it would be hard to draw too fine a distinction. At the time it was published, this book made a contribution to the public understanding of the range of Rackham’s art and the nature of his imagination, and was no doubt eagerly pored-over by his many admirers. To reprint it now seems slightly beside the point. 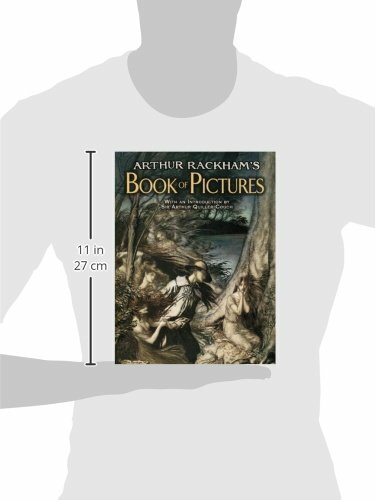 If someone wants to buy a lavishly illustrated survey of Arthur Rackham, they will be looking for a balanced overview of his artistic output, including the great illustrated books that made his name, such as The Ingoldsby Legends, Rip van Winkle, and Peter Pan in Kensington Gardens, and also those that sealed his reputation after WWI, such as The Compleat Angler, Goblin Market, and The Wind in the Willows. Such a reader would also want brighter and more truthful colour images than these rather murky reproductions of reproductions. Additionally, one might expect a biography of the artist, a summation of his life’s work, and a consideration of his place in the history of illustration. Instead we are left with the original Introduction by Sir Arthur Quiller-Couch, which is an amiable and highly digressive essay on the nature of childhood, and barely mentions Rackham at all. This is a pleasant book, but the production standards are not high, and anyone picking it up in the hope of finding out information about Arthur Rackham will set it down again in frustration. As a collection of unrelated images of fairies and goblins and nymphs and enchanted landscapes, and even the occasional human child, it will still give pleasure as the record of what Quiller-Couch calls ‘the elusive dreams of an artist’.